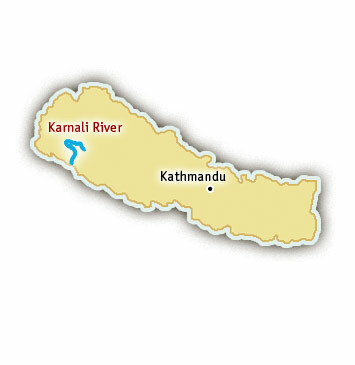 The Karnali River (meaning, Holy Water from the Sacred Mountain) originates in Tibet on Mt. Kailash and gushes down the mountains to form Nepal’s largest and longest river. Located in a less traveled region (the “Wild West” of Nepal), a Karnali River trip provides both a remote and relaxing whitewater rafting adventure and a fascinating cultural experience. On the way to the river, travelers get an opportunity to see the villages surrounding Surkhet and experience the local culture firsthand. Towards the end of a 112 mile Karnali River rafting trip, the Karnali River is joined by the Seti River where it widens and rafters have more time to sit back, relax, and enjoy the spectacular scenery. Scenery: Tropical river forests and jungle, jungle birds, catfish, and fantastic waterfalls! Rafting trips on the Karnali River allow for ample time to soak in some of the most pristine jungle scenery in the world. The Karnali River flows through narrow gorges as well as wider plains as it makes its journey through the foothills of the Himalayas to the Ganges River. Fishing on the Karnali River is some of the best on any river in Nepal with many different fish species including Rainbow Rrout and the prized Golden Mahseer. Karnali River rafting trips are best before and after the summer monsoon season, when the water is clear and the flows are consistent.